There are different definitions of a dry eye. Today it is considered a disease and requires lifelong therapy. The most accepted definition describes a dry eye as a disorder of the tear film due to tear deficiency or excessive tear evaporation, which causes damage to the surface of the eye and it is associated with subjective eye discomfort. The cause of the dry eye are quantitative or qualitative changes in the tear film or its evaporation. Clinical practice shows that quantitative changes are relatively rare. The most common cause of dry eye is tear film evaporation due to the lack of one of its components. The cause can also be an irregular surface of the eye. Depending on the cause, the symptoms of dry eye are divided into two large groups, hyposecretory and hyperevaporative dry eye. The first step in solving this problem is to compensate for the lubrication that the eye loses in this case. Allergies – due to poorer ability to rinse allergens from the surface of the eye, worsening of the symptoms is possible. It is necessary to take into account the need to wash the surface of the eye with artificial tears and in that case we will administer more tear drops of lower viscosity. Creation of scars – a rare disorder that is a result of the more severe case of dry eye. Infection – dry eye has a weakened eye surface protection and may result in viral, bacterial, chlamydial and/or Acanthamoeba superinfection. Artificial tears are the first choice for treating dry eye symptoms. 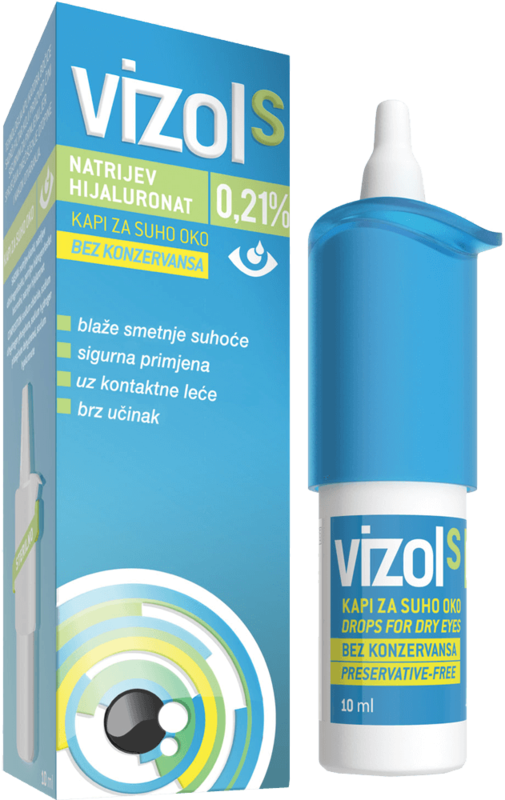 Artificial tears with sodium hyaluronate are particularly widespread in Europe and Japan and are recognized due to the long-lasting nature of the film they create on the surface of the eye, as well as the regeneration of the epithelial cells of the surface of the eye. In the case of severe dry eye disorder, an immediate and long-lasting solution is needed. 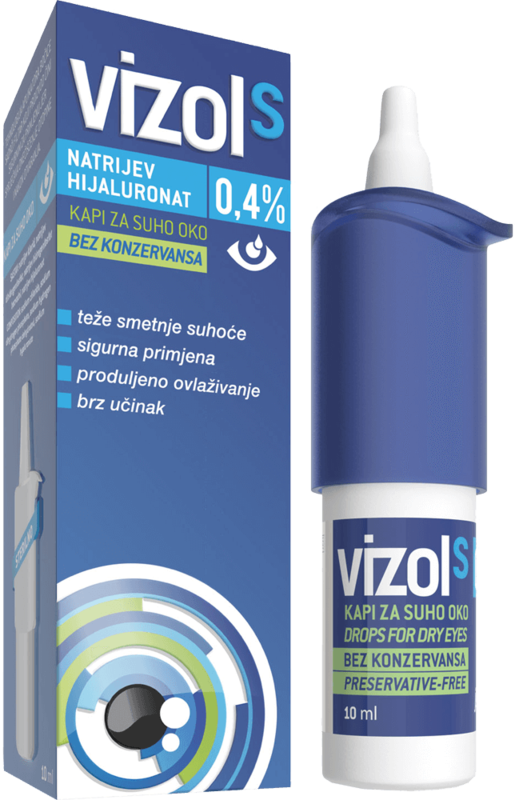 Vizol S 0.4 contains a high concentration of sodium hyaluronate in the form of tears. It is easier to use than a gel and provides a long lasting feeling of comfort.